Welcome to Global RuneScape! Global RuneScape is a RuneScape fansite with hundreds of detailed guides, maps and quest walkthroughs! We offer databases containing information about thousands of items and monsters, in addition various tools designed to enhance your RuneScape experience. We also have a friendly and helpful community where you can discuss and ask questions related to RuneScape! 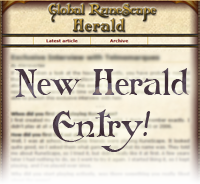 Making its triumphant comeback this week the Global RuneScape Herald returns with none other than GRS veteran Chokelius taking a look at what the site means to him and what the future of RuneScape holds for both Global RuneScape and other RuneScape fansites in 'A New Global RuneScape'. Chokelius helped greatly with the site in its early days, submitting vast amounts of detailed and high quality content so be sure to give him a big warm welcome back and let him know what you thought of this week's herald in the comments below! We're always looking for new Herald contributors so if you've got a great idea that you think would make an interesting article then don't hesitate to get in touch! The Global RuneScape team is proud to present its guide for the latest quest in RuneScape, Some Like it Cold. Head back into the icy north and help rescue a polar bear spy from the clutches of a POW (that's Prisoner of Walrus!) camp. Many thanks to Flinched for this great guide! Hello loyal Global RuneScapers! It doesn't take much to see that things have been a little less than active around Global RuneScape recently. Due to some staffing issues and other preoccupations, things have fallen a little flat over the past year. However, onto the good news - we're back! We've reassembled an elite team of 'Scapers and veteran GRS'ers to help restore Global RuneScape and return it to its rightful place as one of the best RuneScape fansites on the internet! As a gold-level Jagex recognised fansite, you can expect only the best and most concise guides and tips for all of the latest and hardest content in the game along with a bustling active community to share all your stories, strategies and PKing victories with. Of course, we're going to need a lot of help and that's where you come in! If you'd like to help submit any guides, items or monsters then you can do so by heading over to the Submissions / Updates forum. As things are always changing in the world of RuneScape, we're also always in need of updates to the existing content on the website so if you spot anything that's not quite right any more in a guide then please do let us know in the forums! All contributions will be rewarded with contributor points, allowing you to rank up and show your GRS pride among the forums! We have lots of exciting website updates in the pipeline which we're sure will make your day-to-day RuneScaping that little bit easier and more fun so we'll be sure to keep you updated on those as and when we can! Welcome back all and we look forward to seeing you online! Hello all! In the spirit of our current skill week, I've taken the liberty of writing a short article on why Dungeoneering can be an enjoyable skill. You can find it in the Global RuneScape Herald! Feel free to discuss it here after reading. Is it enjoyable to you? "Dungeoneering is controversial, challenging, and enjoyable. This latest Herald entry gives insight into why it is enjoyable to a large portion of the RuneScape community. Enjoy the read!" The Tormented Demon Slaying Guide is up and running. Many thanks to I R 456 on the making of this great guide! Mining, it's what makes the RuneScape economy go round. Without it you wouldn't have your Runite Platelegs or the limestone bricks for your house. This is one of the best ways to make money in the game. A single Runite Ore is worth up to 13k! In this guide we will cover how to get you the leet cape and where the best training spots are. We will be covering free to play methods only! Hello all! 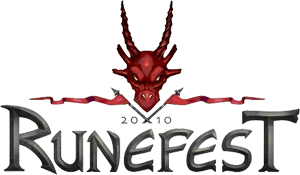 As many of you may already know, I was invited by Jagex to the real-life RuneScape event organized by Jagex, RuneFest 2010, in London. During my stay, I also got to visit the Jagex offices. Head over to the Herald to read about my trip to Jagex and RuneFest. After you've read the article, feel free to ask me any questions in this thread. I may also post more images in the thread, as I have lots of images that I chose not to add to the article in order to not make it too long. Once again, our very own Content Team Members have got together and written a guide. So everyone please congratulate Kevin, Rebel007, and myself (Deathen Shada) on the making of this wonderful guide. So everyone pop on over and have a look at the brand new Firemaking Training Guide! 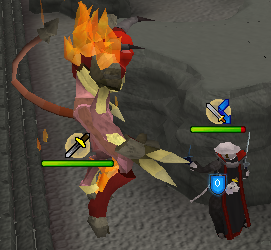 The Firemaking cape is one of the more common skillcapes you will see around Runescape. It is an easy skill, involving only logs, a tinderbox, and a decent amount of time and patience. There are a few different ways we want to show you how to save money, or shorten the time it takes to get 99 Firemaking. We'd also like to go over the different locations that are best for training. This will include both F2P and P2P locations. Hello all! 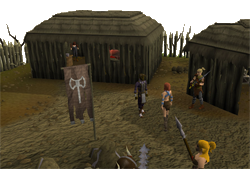 We've just released a quest guide for the latest quest in RuneScape, Gunnar's Ground. Note that this is a rather short and easy quest, and for most players, it should be easy enough to complete without a guide. 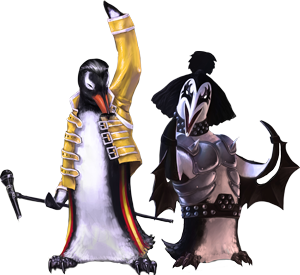 Since this quest has replaced the Romeo and Juliet quest, we've removed Romeo and Juliet from the list of quest guides. If you want to know more about why Jagex decided to remove Romeo and Juliet, see this blog post by Mod Mark. The Waterfiend Slaying Guide is now up and ready thank to Night_elf45 who has done a wonderful job. So stop on over and view this wonderful guide.